Hello everybody ! So I have a Chow, Laika, she's almost 3 month now and she weights 5 kg 500 and I've been wandering how much would she have to weight now ? She took a bath 2 days ago and seems a little thin so I'm little worried. She eats around 150g per day of puppy food. 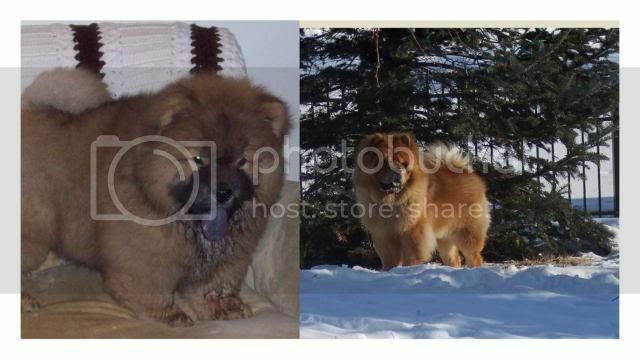 Re: Weight of a female chow. Laika looks great, I wouldn't worry about how much she weighs. Just enjoy her puppyhood and take lots of pictures. It's normal to think chow puppies look thin when you give them a bath because they look different all wet. I agree with 612. She looks great! She looks nice at this age. You should not worry about her weight. It is normal. As she grows and turns 4-6 years, she should weight around 20KG to 26KG. I'm sorry I haven't been around much ! Thank you so much for your responses ! She's great now 7 months 16kg and her period started (proud mama here ).